The U.S. Embassy in Manila and the Lincoln Center in New York City are bringing to the Philippines the Mark Sherman – Tim Horner Jazz Quartet the week of June 14. The visit to the Philippines is part of the Asian tour of the quartet that includes Russia, South Korea, and China. The quartet, which is based in New York City, is bringing with them their deeply-rooted post-bop jazz approach to original and standard jazz compositions. Their music is relentless, energetic, and brimming with improvisation mostly influenced by the music of John Coltrane, Charlie Parker, McCoy Tyner, Elvin Jones and Michael Brecker. The group has performed internationally over the past five years with numerous tours through Europe, the United States, and Canada. Filipino music lovers will get the chance to experience the high level of invigorating musicianship and mastery of harmony and organized sound of the quartet as they perform in Manila and Bacolod City. Catch them live at Greenbelt 3 Park on Friday, June 18, 2010 at 8:00 p.m. and in Cinema 1 of SM City Bacolod on Saturday, June 19, 2010 at 6:00 p.m. Media are invited to cover the free concerts. The members of the quartet, each with strong teaching credentials, will also be sharing their musical talents with young Filipino musicians at various workshops to be held at the UST Conservatory of Music, Ayala Museum and at the University of St. La Salle in Bacolod City. 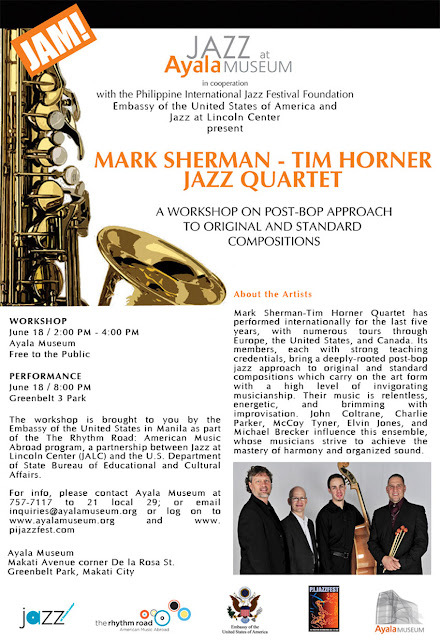 The tour is under the auspices of The Rhythm Road: American Music Abroad program, a partnership between Jazz at Lincoln Center (JALC) and the U.S. Department of State Bureau of Educational and Cultural Affairs. The program is designed to foster cultural exchange with audiences worldwide. The U.S. Embassy in Manila has partnered with the Greenbelt Malls, UST Conservatory of Music, PIJazzFest Foundation, Ayala Museum, SM City Bacolod, Jazz Society of Negros and the University of Saint La Salle to make this program possible.